The idea is that the customer wait, due to the customer disappearing or leaving the area and the space available for trays on the counter! It does help to not be calling them over and over to get their order! Well, that’s not very customer friendly. 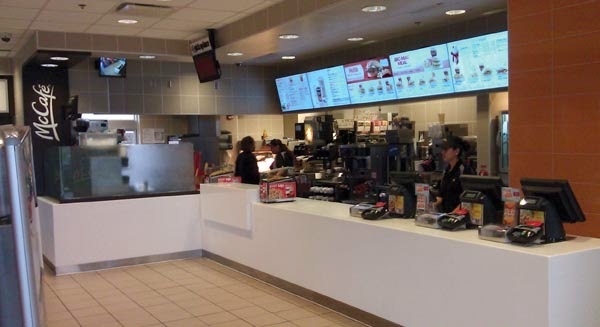 I can see how the control-freaks in Oak Brook would want to herd McDonald’s customers like stupid cattle but that’s not going to them coming back for more. If a store has such poor production speed that customers have to sit down or wander around the restaurant that’s a symptom of bigger problems. In any case, I still want my cup! I submit that letting the customer kill some time getting a drink will keep them closer to the counter. Unless, the self-service drink station is a long way away but that's probably pretty rare. In the many store I've been to the drinks are about three steps away. Give the customer the cup! It frees one more body waiting in front of the counter at a busy lunch/dinner rush, so that another customer can freely walk up and order. The Dual Point numbering will in essence then tell the customer with drink already in hand that their order is ready. Under the new ROIP process, stores will be penalized for violating that procedure. Its a stupid rule. Can't be bothered ordering coffee in McDonald's at the dual point you just stand there waiting while nothing happens then eventually someone makes the coffee an takes it to the dual point service area. I like the old system where you order a coffee , the person makes it and then gives to you.